I've had a bit of an urge to shop recently which of course means that a few things have found their way off my wish list and into my possession! I've been meaning to get some kind of supplements or "superfoods" for a long time now so after a few discussions on Twitter last week I decided to try Maca powder by Organic Burst. I went for this particular brand as they have a great reputation for being one of the best providers of organic superfood supplements and they're also affordable too. Maca contains a variety of nutrients to help with energy levels and reduce tiredness and fatigue, which I often have issues with, so I'll be updating you on the results of taking this in a few weeks time! Another thing I picked up is JASON Unscented Naturally Fresh Deodorant Stick for Women. It's free from aluminium, parabens, phthalates and propylene glycol and is specially formulated for sensitive skin. I've not tried this yet so I'll review it at a later date! The final product I've added to my collection is Indie Lee's Calendula Eye Balm. This one I'm really excited about sharing with you, especially after how impressed I was with the Squalane Facial Oil (reviewed here). It's described as "a multitasking miracle balm" to "dramatically diminish dark circles" and increase skin's elasticity. All I can say at the moment is so far so good! As with the other two products, expect a review of this soon! What have you bought recently? Have you tried any of these products before? I have that Jason deodorant and I'm not keen, my Salt Of The Earth stick does a much better job. 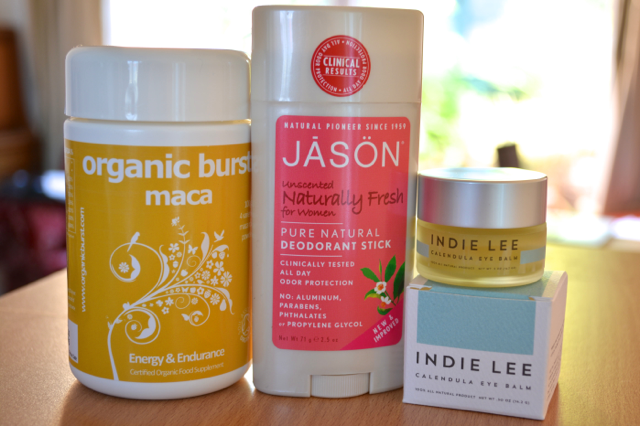 That Indie Lee eye balm sounds gorgeous! I have both Indie Lee's Calendula Eye Balm and Squalane Facial Oil on my next purchase list. Love your reviews! Can I ask, do you use any special lighting? I have a fancy DCLR camera but now need better lighting due to it being dark when I get home. Want to start using for my next year of blogging rather then my mobile. Appreciate any suggestions.